Fifa has submitted a 'criminal complaint' to Switzerland's attorney general after a two-year investigation into possible World Cup corruption. 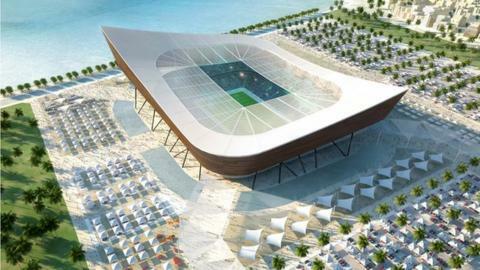 The complaint concerns individuals linked to awarding the hosting rights for the 2018 and 2022 World Cups. However, Fifa said the move does not impact negatively on the decision to name Russia and Qatar as hosts. Fifa ethics judge Hans-Joachim Eckert maintains there is not enough evidence to question the entire bidding process. The latest move has been criticised by Alexandra Wrage, who quit the world governing body's independent governance committee last year. Speaking to BBC Radio 5 live, Wrage said: "It raises more questions than answers. "The public are being asked to accept that there is enough evidence for a criminal complaint to be lodged in Switzerland but there isn't enough to discredit the World Cup bid. That just doesn't seem to make any sense." Last week, Eckert released a 42-page report that cleared Russia and Qatar of wrongdoing, confirming their status as hosts of the 2018 and 2022 World Cups respectively. That report, which has also been handed over to the Swiss attorney general, drew criticism from Michael Garcia, the American lawyer who spent two years investigating allegations of corruption. He claimed it contained "numerous materially incomplete and erroneous representations" and said he would be appealing to Fifa. Fifa continues to reject calls for Garcia's full findings to be published. "We have examined this matter very carefully from a legal point of view, said Fifa president Sepp Blatter. "The result was clear: If Fifa were to publish the report, we would be violating our own association law as well as state law." "By involving Swiss prosecutors, Fifa will hope to relieve some of the pressure that has built since world football's governing body was plunged into crisis over its handling of an investigation into alleged corruption. "President Sepp Blatter is still refusing to bow to pressure to publish investigator Michael Garcia's full findings into the bidding for the next two World Cups, but by submitting a criminal complaint with the Swiss attorney-general, he can at least claim to be taking action. "It is possible that criminal charges may now be brought against football officials, but many will question whether the notoriously opaque Swiss legal system is likely to produce meaningful results any time soon."